Today is the sort of weather that my brother-in-law always describes as 'hat-chasing weather'. There is a strong bitter easterly wind blowing, and the sky is grey and leaden looking. I was going to have a go at tidying up a bit more of the garden this afternoon but it is just too cold and windy to be out there so I decided to do a bit more embroidery whilst tucked up in the warm with a hot cup of tea. Inspired by some of the lovely photos in 'Sublime Stitching', I decided to branch out from just embroidering cards and try my hand at something else for a change. 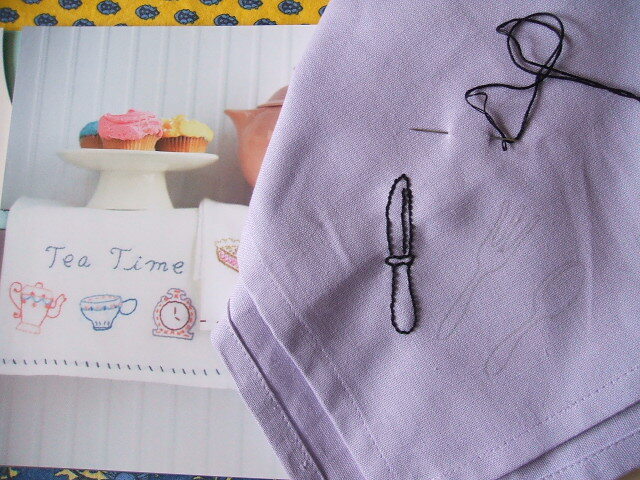 I'm having a go at embroidering a knife, fork and spoon (iron-on transfers from the book) on to four rather nice pure cotton napkins. I got the napkins a few years ago at a car boot sale and had never got round to using them. They were nice material, and a nice size, but were a bit 'bland' for my tastes. I'm hoping the addition of some embroidery will prompt me to actually make use of them at last. Here's hoping the weather soon bucks up and actually becomes a bit spring-like. I'm having serious car boot sale withdrawals, having not managed to get to a single one yet this season. Judging by the weather forecast for the next few days I fear I shall have to miss out yet again this weekend. At least I've got the embroidery to be getting on with! Can you believe we might have more snow tomorrow? Our yard sale season has really yet to start. I love Sublime Stitching. It is such an inspiring book. Hi Elizabeth, your embroidery is so pretty, that book is on my wishlist at Amazon, one day I'll treat myself. I think I'm in for another weekend at home, the forecast isn't looking good for boot sales. Did manage to get to some last weekend though, lovely to get out again.